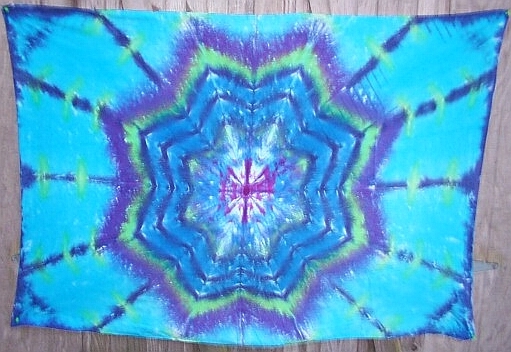 We began making dyes with our good friend Pat, he was an amazing artist! He could whittle a stick into something you would treasure forever, he actually made each of our kids their own first spoons. He would stop by when following the Grateful Dead Tour and make dyes to sell at the shows. If you ever met him at the shows you could never forget his laughter, it would ring throughout the parking lot! When Pat realized his health was failing he encouraged me to work with him on the dyes and learn a bit of his magic. It was an honor and I will never forget those hours spent out in the yard working with him. While Pat followed the Dead Tours, we would work the Folk and Bluegrass Festivals that were within driving distance. We always worked the shows as a family, with our four kids helping out. We almost always had a bunch of the kids friends along with us. There were some festivals where we had a kids camp of about 20 or so kids, these kids learned to work the festivals too, helping out wherever the promoters might need them. It made for some interesting experiences, crazy road trips and a whole lot of fun. Now the kids are adults and busy with lives of their own, however, they will still lend a hand to Mom and Pop at the shows when they can. For us it was not about making money, but the joy of creating and sharing with others. Working the festivals offered us the chance to meet and work with some great artists and activists, we were able to lend our support to such causes as the arts in education, kids at risk, environmental concerns, human rights, hiv/aids, tolerance and peace. This is our first venture into selling online, we usually only display our work at music festivals. Most items can be shipped out within two or three days. We use USPS priority mail in most cases, unless the order is large and then shipping will be calculated by weight. We will contact you with shipping charges in such cases. Special orders are always welcomed, contact us with your request, and we will let you know how we can work it out. For larger orders such as team, school or festival shirts, we will need some time to prepare the product, usually a couple of weeks. We have dyed stage backdrops, event shirts and just about anything you can think of, we can even dye a favorite old shirt ( depending on fiber content ) and give it new life. We use Google Wallet for payment processing. We hope you will have a positive shopping experience and enjoy visiting the site.